As Iraqi Shiites celebrate the holy month of Muharram and its key holiday of Ashura (4 November), it can be argued that radical sectarian mobilization among them has risen to a level unprecedented in modern Iraqi history since 1927, when a series of episodes prompted calls among the Shiites of Iraq to form their own separate state. This year, too, visions focusing on the possible separation of the Shiite-majority provinces of Iraq as a separate political entity are back on the agenda. The last time such ideas were being considered in an even remote way was in 2005, when Abd al-Aziz al-Hakim of SCIRI launched his scheme for a single Shiite federal entity stretching from Basra to Najaf. It was the first time since 1927 that anything in the way of territorial separation of Iraqi Shiites had received any serious attention whatsoever. However, back then the project was characterized by only fragmented levels of support, with most Iraqi Shiites still speaking in the name of a unitary state. An even more radical movement to separate the south entirely had even less of a support base. However, following the rise to prominence of the Islamic State of Iraq and Syria (ISIS) in 2014, Iraqi Shiite discourse on the Iraqi state appears to have changed quite dramatically – in the direction of separatist solutions. It is true that some of the talk of a separate Shiite entity, often referred to as the “Sumer” project in a reference to one of the ancient civilizations of Iraq, may have gained extra prominence because of the proliferation of social media, meaning that a wider array of Iraqi Shiite voices are accessible to outside analysts than at any point in history. However, it is noteworthy that also more established political parties among the Iraqi Shiites appear to be warming up to ideas that were considered a taboo just a few years ago. A case in point is the State of Law alliance of former PM Nuri al-Maliki and current PM Haydar al-Abadi. In a first, during Ramadan, a key website supportive of Maliki accorded much prominence to an article that openly hinted at the possible secession of the Shiite areas from the rest of Iraq. Also, changes in the regional environment contribute to a greater push towards separatist solutions. Iran, in particular, has altered its approach to Iraq in a dramatic way since the emergence of ISIS. In unprecedented ways, it is openly acknowledging and even propagandizing its military support for the Iraqi government through the presence of Iranian advisors among Iraqi military forces deployed on the frontlines against ISIS. The confirmation by the Iraq parliament of an interior minister with a background in the Iran-sponsored Badr brigades arguably gives Tehran more direct influence in Iraq’s security forces than they had under Maliki. The optics of the Iraqi battlefield look increasingly sectarian as well. In the north-west country almost all the territory recaptured by Iraqi government forces from ISIS are areas associated with Shiite minorities or Kurdish territorial claims. Also recent Iraq government victories in the Jurf al-Sakhar area in Babel, while covering Sunni-minority lands, essentially fall into a picture of wider Shiite consolidation in a core territory from Basra to Samarra. There are however still some important exceptions to the general trend towards sectarian fragmentation in a territorial sense. This relates above all to Iraqi Sunnis that want nothing to do with ISIS. In a macro perspective this can be seen above all in Anbar, where several key areas including Ramadi still remain outside direct ISIS control. Those who say the quick fall of Mosul is sign that ISIS enjoys general Sunni Iraqi legitimacy will have trouble accounting for the continued existence of pockets of resistance to ISIS among Sunnis in Anbar. If the fall of Mosul to ISIS is proof that Shia discrimination of Sunnis is the underlying cause of the current troubles, then why didn’t all of Anbar also immediately fall? Also at the level of individual politicians, these tendencies can be seen. Provincial councils of Anbar and Nineveh alike continue to operate outside ISIS-controlled territory and repeatedly have condemned ISIS. Prominent Iraqi Sunni politicians like Usama al-Nujayfi have made a point of visiting the Shiite clergy in cities like Najaf and Karbala, which of course is anathema to the rabidly anti-Shiite ISIS. Beyond this, many of the same historical and practical arguments against separatism that transpired in 2005 remain relevant. The Iraqi Shiites can offer no historical precedent for their separatist scheme, and the link to the old, pre-islamic Sumer civilization has of course nothing more to do with Shiites than with Sunnis (Saddam Hussein was also a huge Sumer enthusiast). And at the practical level, Iraq remains a multi-religious country whose disintegration would likely lead to huge numbers of displaced people, quite possibly creating human tragedies on a scale worse than anything caused by ISIS thus far. With foreign military advisors of all descriptions pouring into Iraq and the concomitant internationalization of the whole debate pertaining to the future of the country, it becomes doubly important that Western pundits exercise caution when they go about attributing cause and effect in the current crisis. In particular, the notion that ISIS somehow embodies “legitimate Sunni demands” must be rejected. To maintain such a view is not only an affront to the large numbers of Iraqi Sunnis who bravely resist ISIS, often by putting their lives on the line. It also means accelerating a process towards a territorial fragmentation of Iraq that lacks historical basis and points towards an uncertain future. Parliament Speaker Usama al-Nujayfi’s recent outburst about potential Sunni separatism has had the side effect of a limited resurgence of discussion of federalism among Iraq’s Shiite Islamist factions. So far, the contributions to this reawakened debate follow patterns that are familiar to those who followed the previous discussion about federalism south of Baghdad in the 2005–2007 period: The Shiite Islamists remain divided on federalism, with many signalling only limited interest in the concept as such, and most players being explicitly opposed to the idea of a single Shiite region that was propagated by ISCI and the Hakim family from 2005 onwards. Only some Kurds keep calling for a tripartite Iraq made up by ethnic and sectarian regions. For his part, Muqtada al-Sadr has commented on the recent threat by Usama al-Nujayfi by challenging the inhabitants of these regions to prove their interest in federalism in a referendum. He added that he was against any kind of federalism that would lead to partition… Also, to the extent that there are departures from this general trend, they relate to Basra – as they always did in the past. In a recent statement Jawad al-Bazuni, a young deputy from Basra affiliated with Daawa (Tanzim al-Iraq) exhibits this tendency. Echoing pro-federal tendencies in evidence among State of Law deputies who captured the governorate council in Basra in January 2009, Buzuni says the creation of multiple federal regions would be the best solution in Iraq in the context of enduring political tension. Buzuni also highlights the Kurdish experience as a successful case of federalism. Perhaps the greatest surprise in all of this has come from a “Sunni source” – Nujayfi himself. In media comments subsequent to the latest controversy about his statements, Nujayfi revealed that in addition to the petition by the Basra governorate council for a federalism referendum that was submitted in the second half of 2010 (but has so far remained unaddressed by the government in Baghdad in violation of the law on implementing federalism), a similar petition from the governorate council in Wasit, signed by 16 out of 28 council members, was submitted some 2 months ago. This is interesting because Wasit has not figured prominently in past discussions of federalism among Iraqi Shiites. The existence of an oilfield operated by a Chinese company in the governorate adds to the complexity of centre–periphery relations in this case, as does the fact that the State of Law alliance is severely divided there, with a recent split between the Shahristani and the Maliki blocs (the Shahristani supporters have joined independents and the Iraqi Constitutional Party). The exact political configuration behind the latest pro-federal move remains unclear, but an ISCI politician played a key role in making the first moves in 2010. He has lived in the country less than half of his life but the 37-year old Ammar al-Hakim, the new leader of the Islamic Supreme Council of Iraq (ISCI), continues to spend time contemplating radical changes to the state structure of Iraq. In a recent interview with Iraqi television, he made it clear that he still envisages the creation of multiple federal regions in Iraq south of Kurdistan. In the period between 2005 and 2007 Hakim was perhaps the single most vocal spokesperson for the idea of a single, Shiite sectarian region to be established from south of Baghdad to the Gulf. While he no longer pushes that particular configuration of governorates to form a new region, the recent interview makes it clear once more that he has no qualms about future changes to Iraq’s administrative map: One governorate, three governorates or nine governorates in a single federal region, that is for the people to decide, says Hakim. Iraq may perhaps be the cradle of civilisation with a millennia-long tradition of centralised government but to Hakim this historical legacy simply seems irrelevant. While legalists will point out that Hakim is finally moving closer to the 2005 constitution, a more meaningful interpretation of the significance of his statement emerges when it is contrasted with what other Iraqi politicians are saying these days. Just within the past weeks, representatives for the Daawa party (Abd al-Hadi al-Hassani), Iraqiyya (Maysun al-Damluji), Hiwar (Mustafa al-Hiti) and the Sadrists (Talib al-Kurayti) have all expressed scepticism to the creation of any new federal entities. Several have hinted that restrictions on federalism may be a subject for the upcoming constitutional review. In other words, when most Iraqi politicians finally seem to respond to recurrent popular demands for an end to federalisation and a greater focus on more pressing issues of security, health and the economy, Hakim makes a point of keeping such options open. This in turn highlights potential contradictions inside the newly created Iraqi National Alliance, where Hakim is playing a key role. In a recent interview with the Christian Science Monitor that has been widely reproduced in the Iraqi press, another leading ISCI figure, Adil Abd al-Mahdi, weighed in on the issue of state structure. Although some of the translations of the interview have clearly been garbled in the Iraqi press, the one by the Furat television channel based on an ISCI press release is probably an authoritative account of what Abd al-Mahdi intended to say. Put briefly, in his view, the goal of the new coalition is to create a unified government without ideological contradictions: “It is impossible to have a centralist view within a government that believes in decentralisation”. Seen in isolation, this is clarifying: The Iraqi National Alliance confirms its decentralisation ideology and emphasises its differences with others in the Maliki government, such as the premier himself, on the issue. Alas, the problem, of course, is the presence of certain arch-centralists – in particular the Sadrists – as a key element in the new Shiite-led alliance. Clearly, if Abd al-Mahdi were to follow through on his own logic, the obvious next steps would be as follows: Firstly, to cut all contact with the centralist Iraqiyya (with whom negotiations supposedly still go on). Secondly and, more importantly perhaps, to ditch the Sadrists, who also reject the creation of more federal entities. But they are not going to do that, are they? After all, the Sadrist votes for the Iraqi National Alliance are badly needed. For his part, Ammar al-Hakim has already declared that he will not subject himself to the unpredictable whims of voters by running as a candidate. And whereas ISCI earned one third of its members of parliament in 2005 not on the basis of actual votes for candidates but in post-election distribution of so-called compensatory seats at the national level, the Sadrists are holding a kind of primaries these days, with a reported turnout of 16,000 in Dhi Qar. The Sadrists, in turn, are under instructions from Muqtada al-Sadr to select only non-clerical independents, making it even less likely that ISCI would benefit from the Sadrist vote under an open-list system. This illustrates a more widespread dynamic related to the ongoing debate on the elections law. In public, all the parties except the two Kurdish ones agree that an open-list system should be used. ISCI supported closed lists in the past but has been pressured into accepting an open-list system after persons close to the Grand Ayatollah Ali al-Sistani increasingly have expressed a strong preference for this. (In fact, for this reason Sistani is almost portrayed as something of a nationalist hero on normally unsympathetic television stations like Sharqiyya these days, so don’t say Iraqi politics isn’t changing!) In theory, then, the only remaining problem with the elections law should be what to do with Kirkuk, and even here a compromise should be possible after a very helpful proposal two days ago by Hasan Turan, a Turkmen representative, to make provisions for a re-examination of the voter register for that province – an idea that received public support yesterday also from Usama al-Nujayfi, another powerful voice from the north. However, it is reported that several parties are unsecure about their real standing among voters and secretly prefer the closed-list system for that reason. The motive is that with a closed list the big vote-getters (such as the Sadrists) can enhance their electoral prospects by creating a “ticket” in a very literal sense – i.e. by giving others, less popular politicians, a free ride to parliamentary seats that would otherwise be at risk (that is, if voters were given a chance to intervene in the selection of candidates). As if to underline the lack of respect for Iraqi voters, with all these issues pending, the parliament has announced it will not reconvene until 13 October, only two days before the deadline for completing changes to the electoral system. The standardised Western narrative on Basra political developments over the past two years is as simple as it is deceptive: For a while, the people of Basra were terrorised by militia rule directed mainly by two “extremist” and “milita-affiliated” groups – Sadrists and the ruling Fadila party – but this sorry state of affairs came to an end in March 2008 by the heroic intervention of Prime Minister Nuri al-Maliki, variously celebrated as the “legalist”, the “secularist” and the “hater of the Iranians” depending on the writer’s closeness to the Bush administration. The militias disappeared, “the rule of law” was restored in Basra, and Maliki was rewarded by the Basrawis last January with a resounding win in the local elections. The reality in Basra these days is somewhat different. Since the assumption of power by the new local government last April, reports of increasing Islamisation of Basra’s public sphere have intensified. Growing pressures towards Islamic dress code in public-sector workplaces have been reported, along with increased attempts at gender segregation in public spaces like parks and university areas. In August came a formal ban on the sale of alcohol. Some of these moves have been championed by the very “secularist” list that Maliki’s alliance was supposed to represent, with the new governor Shaltagh Abbud in the lead. However, by far the greatest enthusiast for imposing strict Islamic order in Basra society – in fact, his zeal is such that other council members have had to restrain him lately – is from neither the Daawa nor the Sadrist camp. Rather, Shaykh Ahmad al-Sulayti is a leading figure of the Islamic Supreme Council of Iraq (ISCI) and a preacher in Zubayr, traditionally a Sunni stronghold but since the 1960s increasingly populated by Shiites. 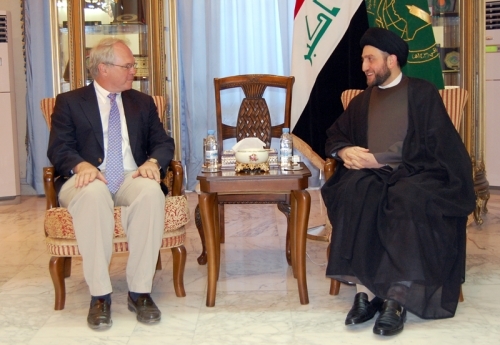 He has been at the forefront of several of the recent legislative initiatives aimed at enhancing the observation of Islamic codes of conduct in Basra. Like many other Shiite activists he refers to the elusive “marjaiyya” as his source of authority; at his website this is operationalised with links to the “four great” top ulama of Iraq – the Grand Ayatollah Ali al-Sistani and the three other leading traditionalists of Najaf. Basra may be in the middle of a water supply crisis but Sulayti’s current preoccupation is that he wants Basra’s men to grow their beards – to let the beard flow freely, as the Arabs say – a matter in which he is indeed supported by Sistani fatwas. It should be stressed that the way he has gone about this business in itself seems quite innocuous: Last week he introduced a law that would prevent public officials from directing employees to shave their beards, referring to the principle of individual freedom. But if his strategy thus seemed somewhat indirect (and not really different from, say, campaigns by Muslims in Europe for the right to wear the hijab at work), it was considered to go too far by the rest of the council (which had previously approved the ban on alcohol) and was cancelled a few days ago after having first been adopted. The situation in Basra has wider ramifications that are as fascinating as they are potentially explosive. At some point, members of the Iraqi public with an interest in Islamic law are likely to ask themselves why, given the theoretical oneness of Islamic law, is it legal to sell alcohol in Baghdad and not in Basra? More likely, they will not stop by asking themselves, but may well want to pose the question to other authorities that are supposed to be in the know about these issues, like the Grand Ayatollah Ali al-Sistani, or the Federal Supreme Court, or, worse, perhaps both of them at the same time. Even more critically, some may want to know why the ban is not being implemented in the streets of Arbil and other parts of the Kurdistan Region, which just like the rest of the Iraq is subject to the constitutional imperative that no legislation may contradict the fundamentals of Islam. In this battle between Islamic law and secularism lies the conflict that could one day topple the project of Iraq as an Islamic federation, as set out in everything but the name in the 2005 constitution. And if the issue is not raised by the Iraqi public itself, it will under any circumstances force its way onto the agenda once the law on the composition of a new federal supreme court – promised in 2005 but considered a too sensitive subject until now – is to be debated in the Iraqi parliament. Baghdad, District of the Green Zone?? The debate about Iraq’s state structure rarely fails to make perplexing twists and turns, and the latest discussion concerning the status of Baghdad as Iraq’s capital city is no exception. In a scheme reported by several Arabic news media, local politicians in the Baghdad governorate council have presented the vision of the Green Zone as the future federal capital of Iraq – on pattern of the special status that Washington, D.C. has in the US system of government, with the rest of the governorate presumably acquiring a “normal” status (and with small chunks of neighbouring city quarters being annexed). One would perhaps have thought that this kind of scheme could have originated with ISCI, the only party among the Shiites that has spoken out in defence of sectarian models of federalism, because theoretically it might then become easier for any future Shiite federal region to eat into parts of Baghdad. ISCI members have distinguished themselves in the Iraqi federalism debate earlier also by highlighting the option of federalising Baghdad as a standalone unit (it is constitutionally barred from becoming part of any other region under the current system). And, indeed, ISCI’s provincial council head in Baghdad, Mu‘in al-Kazimi, has been among the foremost promoters of these new ideas. More surprising, however, is it to find Daawa member Salah Abd al-Razzaq speaking positively about this kind of project. Only months ago, he was in the media spotlight as the Daawa decided to contest the forthcoming 31 January local elections on a separate list from ISCI, not least because of disagreement between the now more centralist Daawa and the strongly pro-federal ISCI. Back then, many “centralist” independents in the United Iraqi Alliance camp that are believed to be in regular touch with Sistani, such as Husayn al-Shahristani and Safa al-Din al-Safi, chose Maliki’s side rather than Abd al-Aziz al-Hakim’s. But now also Abd al-Razzaq from Maliki’s group has signalled interest in the “federal district” plan. 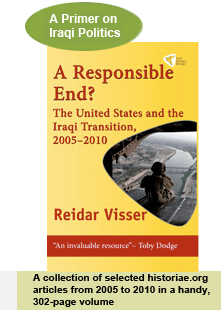 It is hard to see how the scheme fits with the 2005 constitution, where even in a general tendency of extreme concessions to the centrifugal forces in Iraq at least the concept of an undivided capital seems to survive. Baghdad “with its municipal borders” is the capital of the Republic of Iraq “and shall make up the governorate of Baghdad”. One can understand the dilemma of local councillors who feel that urban development may not receive the attention it requires when the governorate of Baghdad is also tasked with matters relating to the infrastructure of the federal government, but Baghdad has such a symbolic position as the nation’s capital that any tinkering with its status is likely to meet with considerable scepticism among the Iraqi public at large. An initial challenge would be to find a reasonable name for the new creation. Posted in Iraqi constitutional issues, Shiite sectarian federalism, UIA dynamics | Comments Off on Baghdad, District of the Green Zone?? In a strange series of comments given to the Iraqi news agency Aswat al-Iraq, Ammar al-Hakim highlights the importance of holding early provincial elections and seems to forget that his own party, ISCI, has been at the forefront of attempts to derail those elections. First, back in February, ISCI along with the Kurds fiercely resisted the insertion of a timeline for elections into the provincial powers law. Subsequently, after having been defeated by a parliamentary majority on the issue, ISCI tried to use the presidential veto to avoid elections. More recently, ISCI has continued to complicate the parliamentary deliberations on the elections law itself through continuing to demand the right to use religious symbols for campaigning purposes. In a remarkable statement in the most recent interview, Hakim refers to the “timeline for elections laid down by the Iraqi constitution” – surely he must know that there is no timeline for local elections in the constitution. Perhaps sensing a degree of pressure from the higher Shiite clergy, Hakim now tries to present ISCI as an advocate of early elections – unsurprisingly, he now blames the very parties that demanded elections in the first place for trying to obstruct them! This refers to the demand by a majority of Iraqi parliamentarians that pending elections in Kirkuk, and as part of the elections law, there should be some kind of shake-up in the local administration there in the direction of greater power-sharing between the various communities. This demand reflects a widespread desire among Iraqi parliamentarians to challenge the hegemony of ISCI, the Kurds and Maliki in dominating Iraq’s politics – a hegemony which came under threat when the provincial powers law with the timeline for elections was adopted back in February, but which has since been restored through heavy-handed action (often with US support) against political enemies of all shades, in many cases on the pretext of vaguely defined “security” concerns that have yet to result in formal charges against those targeted in the operations. In the interview, Hakim is less bullish than ever before on the idea of forming a big Shiite region. This time, he merely refers to the constitutional provisions on the subject, which leave the issue to popular grassroots initiatives. In early August 2007, Jalal al-Din al-Saghir, a Shi‘i preacher affiliated with the Islamic Supreme Council of Iraq, made headlines with striking comments to a reporter for the Christian Science Monitor. The cleric revealed in an interview with Sam Dagher that “a massive operation” was underway to secure the establishment of a Shi‘i super-province in Iraq, to be named the “South of Baghdad Region,” and projected to encompass all nine majority-Shi‘i governorates south of the Iraqi capital. Saghir claimed that his party had already drafted detailed plans for how such a super-province would be governed — plans of such importance to Iraq and the region that there was “no room for misadventures”… Full story here. Among the numerous fallacies that have become widespread in analyses of today’s Iraq is the notion that the Shiites of the country are unified in demanding the establishment of a sectarian federal entity, a Shiite super-state. And even though some studies at least acknowledge the internal Shiite division between anti-federal Iraqi nationalist and supporters of federalism, few bother to examine important sub-divisions inside the pro-federal camp. In many accounts there simply is only one Shiite federal vision of the future: iqlim al-wasat wa-al-janub (the Region of the Center and the South), covering all the nine Shiite-majority governorates to the south of the Iraqi capital. Full story here.